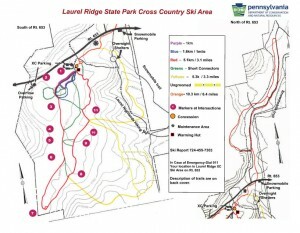 Laurel Ridge XC Ski Center is located on one of the highest mountain ridges in the Laurel Highlands region of South Western Pennsylvania. Our ski center operates out of Laurel Ridge State Park’s concession building managed by the Laurel Hill State Park DCNR of Pennsylvania. Our main ski trails are groomed for skate skiing and tracks set for classical skiing. (Trail Pass Required)- all Trails are groomed on a daily basis depending on condition and snowfall.